Mirages have long astonished travelers of the sea and beguiled thirsty desert voyagers. Traditional Chinese and Japanese poetry and art depict the above-horizon, superior mirage, or fata morgana, as exhalations of clam-monsters. Indian sources relate mirages to the “thirst of gazelles,” a metaphor for the futility of desire. Starting in the late eighteenth century, mirages became a symbol in the West of Oriental despotism—a negative, but also enchanted, emblem. But the mirage motif is rarely simply condemnatory. More often, our obsession with mirages conveys a sense of escape, of fascination, of a desire to be deceived. 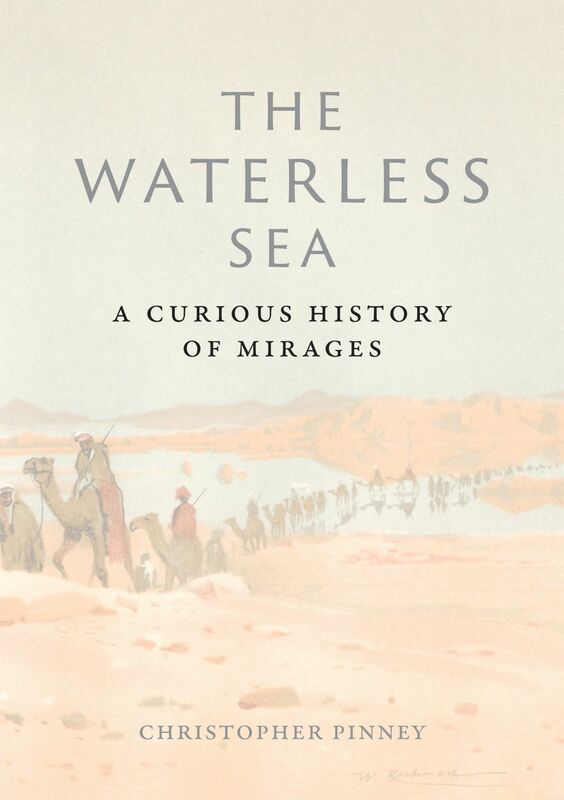 The Waterless Sea is the first book devoted to the theories and history of mirages. Christopher Pinney navigates a sinuous pathway through a mysterious and evanescent terrain, showing how mirages have impacted politics, culture, science, and religion—and how we can continue to learn from their sublimity. "Pinney has emerged with perhaps the finest homage to evanescence yet written. . . . Ultimately The Waterless Sea reveals its author to be as spiritually refracted as the ­ elusive and translucent occlusion he seeks to own; the richness of his sensibility is every bit as compelling as his subject. As Pinney shows, the mirage is primarily a phenomenon of spiritual resonance, ungovernable and in that, unimaginably potent. Fueled by the tangible in its creation of the fantastic, the mirage exists to turn the human eye inward." "Pinney's fascinating new book . . . traces the illusions of mirages through many eras and cultures and environments. . . . Throughout history, from China to Persia to India, . . . he's a shrewd reader of the patterns underlying all such visions." "Anyone who has driven down a hot asphalt country road will have seen in the distance what appears to be a pool of standing water that remains perpetually out of reach. In The Waterless Sea, anthropologist Pinney delves into the many accounts of fantastic mirages that have been reported over the centuries. No mere optical illusions, he says, mirages are real and are produced by atmospheric optics. Their interpretations, however, have been shaped by culture, politics, religion, and science. Their illusory qualities drive Pinney’s philosophical discussion, which touches on a number of topics, such as their use as metaphor and moral lesson. Historical photos, prints, lithographs, and paintings illustrate Pinney’s erudite narrative." "Pinney’s erudite and highly readable account of the mirage is a scintillating journey through more than just an ephemeral intangibility. It is a substantial history of the sublime as it is refracted on the surface of what remains enchanted, mysterious, and strange."